The shimmering heat and dust surrounding their cottage is a helpful reminder to the sisters that they are now part of Australia and that they need to pray for the people of the region, who are battling ongoing drought.It was a special day on Saturday when the Diocese of Wilcannia-Forbes welcomed back members of the Carmelite order with a Pontifical High Mass attended by nearly 500 people from across Australia. The Carmelites had established themselves in Parkes in 1949, but merged with another group from Dulwich Hill and moved to Varroville, southwest of Sydney, in 1987. Wilcannia-Forbes Bishop Columba Macbeth-Green OSPPE said: “I am overjoyed that in our diocese we have a contemplative Carmel that will pray for us all day and every day – not only for our diocese, but for our nation. The community of nuns, who live a pure contemplative life nourished by the extraordinary form of the Mass, approached Bishop Macbeth-Green four years ago with their plan. 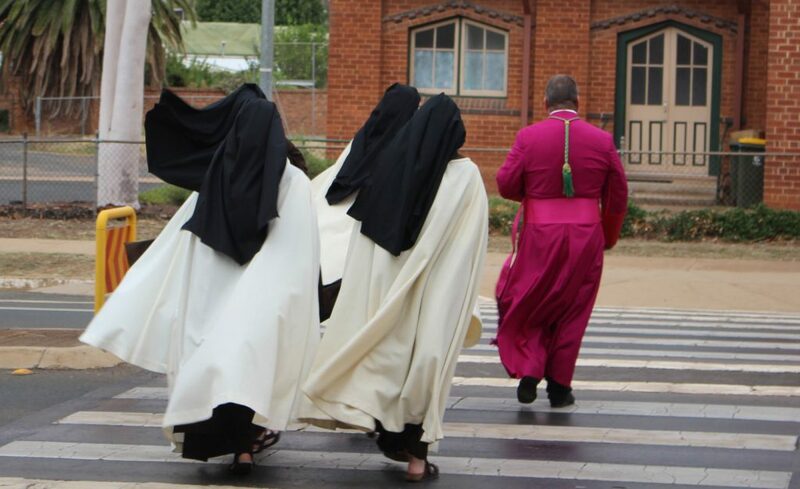 “After a lengthy process headed by an independent committee and with the approval of the Holy See, the nuns are ready to begin their lives in the Diocese of Wilcannia-Forbes, located in between Deniliquin and Mathoura,” Bishop Macbeth-Green said. The sisters are from a Carmelite order that can be traced back to a 16th-century Spanish Carmelite monastery founded by St Teresa of Jesus. Two daughter monasteries were established in Mexico and, in 1927, the community established a Carmel in California. Later, Monasteries were later founded in Nevada, Nebraska, Pennsylvania and, most recently, Idaho. The sisters, all fully professed nuns who have lived the monastic Carmelite life for many years, are: Mother Mariam Joseph, Sister Frances Teresa, Sister Maria of the Incarnation and Sister Juana Teresa of Jesus. Two were born and raised in Australia and have a particular joy in returning to their homeland after many years’ absence. Georgina Brazier, one of the committee members Bishop Macbeth-Green appointed to help facilitate the nuns’ return the diocese, said the sisters are “overwhelmed by the lovely welcome that they had from the diocese”. “We are so grateful to Bishop Columba for his wise guidance in this process and, with their new monastery, the sisters now have a very secure base and already have letters of enquiry for future vocations,” Mrs Brazier said. The primary mission of the Carmelites, who have a strong devotion to St Joseph, is to pray and offer oblation for the Church and the world. The sisters live a life of poverty, entirely depending on the generosity of others.